Where Were You When Blink-182 Broke Up? On this date, February 22, in 2005, SoCal pop-punk trio Blink-182 went on “indefinite hiatus,” music-business speak for “we’re breaking up but probably not forever, get bummed but not too bummed.” That was 13 years ago and I was 13 years old, at the time, living in Hanau, Germany, a tiny town outside of Frankfurt, Germany. (Hanau is best known for birthing the Brothers Grimm, the fucked-up fairytale guys, and that’s...about it.) It was three days before my 14th birthday and you wouldn’t believe how many goddamn tears I cried. I never got to see them live and I thought it was the end: of them, of me...of humanity, too, probably. 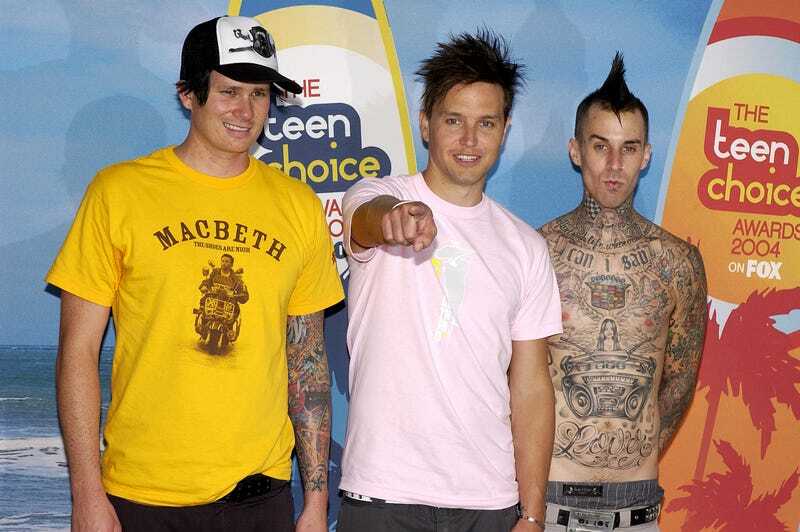 Of course, the classic lineup of Blink-182—drummer Travis Barker, guitarist Tom DeLonge, and bassist Mark Hoppus—would appear together for the first time, publicly, five years later at the 2009 Grammy Awards, which eventually led to a proper reunion and their synth-rock epic, 2011's Neighborhoods. (I’ll save you the time, that album is...not good.) They called it quits soon after, mostly due to an on-again, off-again, completely off-again relationship with DeLonge, who would ditch pop-punk for UFO chasing. Whatever the case, that 2005 breakup hit the hardest, because it was the first, and they were so goddamn good there for a minute (I was a tween, let me live). So I ask: Where were you when they called it quits? And, like, are you okay? Is Tom DeLonge Going to Rejoin Blink-182?